To provide a mobile antitank capability, the 2.8cm Panzerbu"chse 41 was sometimes mounted on halftracks. The 2.8cm sPzB 41 was officially a heavy antitank rifle, but its characteristics were actually closer to those of a light antitank gun. Production of this weapon took place from 1941 onwards, but manufacture was discontinued in 1943 due to a lack of tungsten for the projectiles that were fired at very high velocities. This latest addition to the Sd.Kfz. 251 range offers modelers even greater options. It utilizes accurate and well-detailed components from previous Sd.Kfz. 251 kits, as well as the antitank weapon that is a completely new tooling possessing a sophisticated level of finesse. 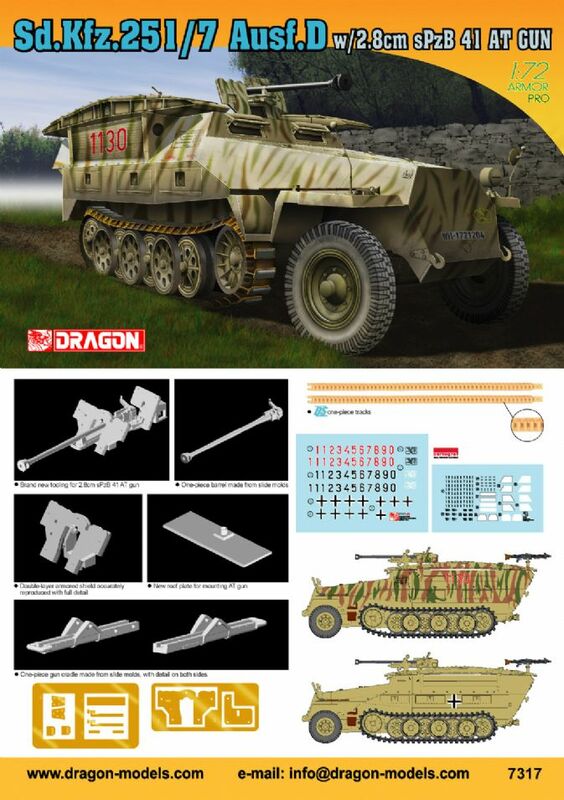 This 1/72 Pionierpanzerwagen kit pioneers new opportunities for modelers! Dragon is going to launch an Sd.Kfz. 251/7 Ausf. D armed with a 2.8cm sPzB 41, the first such 1/72 scale kit in the world. This superb model builds on Dragon’s current range of German halftracks, but it offers something extra special. The Sd.Kfz. 251/7 was used by combat engineers in Panzerpionier companies, and it thus carried small assault bridges and specialized equipment such as mines.